I ought to make more use of my pressure cooker in the summer months. It keeps more heat inside the appliance rather than dissipating it into the kitchen as with the stovetop or oven. 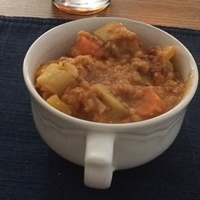 Cuban lentil chorizo stew is an old classic. Developed by Ray, owner of Pressure Cooker Recipes on Yahoo Groups, I do my own take. This time I diced two Yukon gold potatoes, sliced a carrot and chopped a yellow bell pepper. I added a cup of lentils. I had a nearly full carton of vegetable broth which I emptied into the pressure cooker. I set my Cuisinart CPC-600 to 10 minutes on high and allowed 15 minutes when the time was up before releasing the pressure. This one turned out spicy, tasty, and filling.